The Wharf waterfront condo for sale in Orange Beach AL. 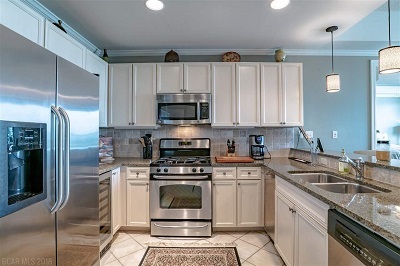 This 2BR/2BA unit has those light colored farmhouse style cabinets that are coveted at The Wharf; floors are tile & carpet; counters are all granite including kitchen & bathrooms; kitchen appliances are all stainless steel including gas range, refrigerator, wine cooler, ice maker & dishwasher; master bath has a large garden tub & separate tiled walk-in shower; master bedroom has two large closets; the '04 stack of units has the most desirable balcony setup of any two bedroom - a simple rectangle shape that makes sense for entertaining; conveys with gas grill on balcony. This unit is conveniently located directly across the crosswalk from your private parking area. You can park, unload, & do not even need to wait for an elevator. Walk straight from your assigned parking spot to the front door with all of your groceries. The Wharf is the Gulf Coast's most inviting shopping & dining destination with exciting entertainment & event options.